Cataracts are one of the primary eye diseases that an eye doctor looks for during an annual comprehensive eye exam. A cataract is a clouding of the eye's natural lens, which lies behind the iris and the pupil. The lens works much like a camera lens, focusing light onto the retina at the back of the eye. The lens also adjusts the eye's focus, letting us see things clearly both up close and far away. If you are concerned about cataracts don't wait, contact an eye care professional near you today! Most cataracts occur gradually as we age and don’t become bothersome until after age 55. However, cataracts can also be present at birth (congenital cataracts) or occur at any age as the result of an injury to the eye (traumatic cataracts). Diseases such as diabetes or of the long-term use of certain medications, such as steroids can also cause cataracts. A cataract starts out small, and at first has little effect on your vision. You may notice that your vision is blurred a little, like looking through a cloudy piece of glass or viewing an impressionist painting. Research suggests that higher dietary intakes of vitamin E and the carotenoids lutein and zeaxanthin from food and supplements are associated with significantly decreased risks of cataract. Good sources of vitamin E include sunflower seeds, almonds and spinach. Good sources of lutein and zeaxanthin include spinach, kale and other green, leafy vegetables. Visit our Healthy Diet for Good Vision section to read more about eye vitamins and how a healthful diet and good nutrition may help prevent cataracts. If you are experiencing any of these symptoms or would like to prevent cataracts, make an appointment with your eye doctor for further recommendations. 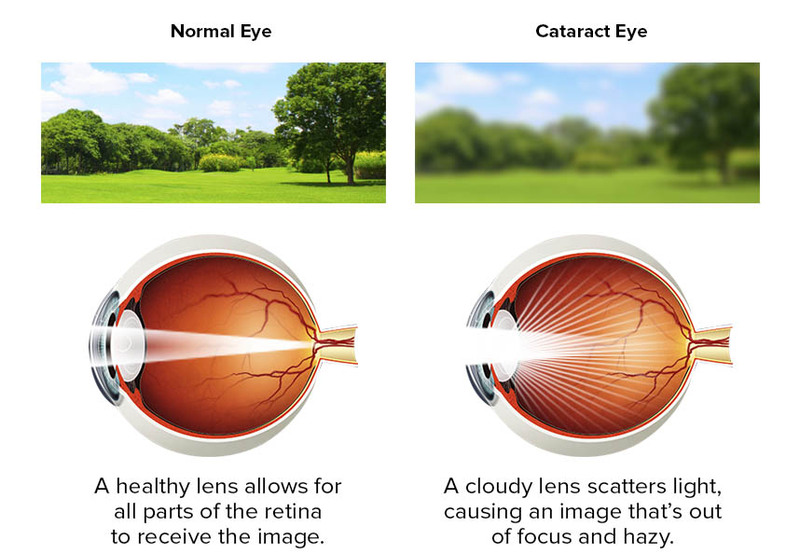 If your vision starts to get blurry, or it feels like you’re looking through a piece of glass, you might be developing a cataract on your eye. Cataracts start small, but can lead to big vision problems. If you begin to experience or “see” these symptoms, call your eye doctor right away!